CATHERINE BENNETT and JASON WEST won ESPN Radio's inaugural "Marriage Madness" contest. The couple, both of whom graduated from the University of Florida, will be married live on "Mike & Mike in the Morning" on May 26. About 500 couples entered the contest. 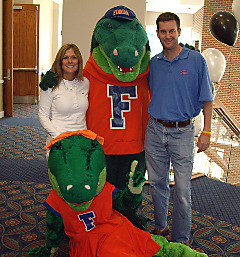 The happy couple, recently profiled for their rabid Florida Gators fandom, are a month and a half from the big day. We wish them all the luck in the world. In case you don't remember, Bennett is the woman who scheduled a double mastectomy for breast cancer around the Florida-Florida State game. • Why West's wife will ultimately think him an idiot. • How, no matter what West does, Bennett will nevertheless label him an idiot. • The inherent nature of idiocy in regards to husbands and their lives in marriage.